The rise of China as an economic and political juggernaut has become a familiar refrain, but now there's another area in which the Chinese are suddenly emerging as a world power: education. In the latest Program for International Student Assessment (PISA) comparative survey of the academic performance of 15-year-olds around the world  an authoritative study released every three years  Chinese teenagers from Shanghai far outscored their international peers in all three subject matters that were tested last year: reading, math and science. In reading, the main focus of the PISA survey, more than 19% of the Shanghai students attained the top two grades, almost double the proportion in the U.S. and nearly three times the average of major developed countries. At the bottom end, just over 4% of the Shanghai students failed to make the grade that is considered the baseline for reading literacy. Elsewhere, on average, four times as many students struggled below that level. This is the first time that China has participated in the PISA tests, and the results are especially stunning because they are so unexpected; only a generation ago, the Chinese school system was ravaged by the Cultural Revolution. But as the tests showed, education in China has been spectacularly rebuilt as a modern, high-performance and egalitarian system, at least in some cities. Even Finland and Korea, two countries that in recent years have been at the pinnacle of international education, were left in the dust with average scores that were considerably behind those of the Shanghai teenagers. And the stunning performance was confirmed by the results of Chinese students in Hong Kong, who came second in math and science and ranked fourth in reading. Some nations that have put in place school reforms in the past decade, including Germany and Poland, did show improvement in the survey. But the U.S. and France, among others, had at best mediocre results that were lower than their reading scores in 2000, the first year of the PISA survey. Conducted by the Paris-based Organisation for Economic Co-operation and Development, the PISA study tested teenagers in 34 OECD nationals and 31 others in 2009. 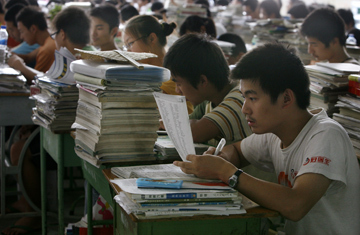 Even without the startling Chinese scores, the latest findings upend some traditional notions about education and should give pause for thought to policymakers everywhere. One surprise is the suggestion that there's little difference in the performance of students from private schools and those from public schools, once socioeconomic differences have been factored out. Another is that paying teachers well is a more effective tool for improving school performance than small class sizes. The survey also raises doubts about the overall effectiveness of aggressive competition between schools. It found that this could trap the most disadvantaged students in the least successful schools, thereby exacerbating social inequality and negatively impacting a nation's overall performance. When it comes to reading skills, rather more predictably, the survey confirmed that girls almost everywhere read significantly better than boys, unlike in math and science, where the tendency is reversed. It also demonstrated conclusively that adolescents who enjoy reading and curl up with a novel for 30 minutes a day score better than those who don't, or who read only comic books. But the big revelation was the spectacular performance of Asian nations, especially those adolescents from China whose reading comprehension was tested. Four of the top five reading performers in the survey were Asian, with Singapore and Korea joining Shanghai and Hong Kong at the head of the class. Among non-Asian countries, only Finland kept up at the very top, although Canada, New Zealand, Australia and the Netherlands were not far behind. Japan also ranked in the top 10. In mathematics, the Chinese results were just as spectacular as in reading: more than 1 in 4 of the Shanghai 15-year-olds showed themselves able to conceptualize, generalize and creatively use information, including modeling complex problems, compared with just 3% of students in the OECD area. Two Chinese cities, of course, don't constitute the academic performance of an entire nation of more than 1 billion people. But in a policy-implications brief for Arne Duncan, the U.S. Education Secretary, the OECD tried to explain why Shanghai and Hong Kong had such high-performing schools. Among the lessons to be learned was that authorities in both cities abandoned their focus on educating a small elite, and instead worked to construct a more inclusive system. They also significantly increased teacher pay and training, reducing the emphasis on rote learning and focusing classroom activities on problem solving. In Shanghai, now a pioneer of educational reform, "there has been a sea change in pedagogy," the OECD said. It pointed out that one new slogan used in classrooms today is: "To every question there should be more than a single answer." "The stunning success of Shanghai-China, which tops every league table in this assessment by a clear margin, shows what can be achieved with moderate economic resources and in a diverse social context," said OECD secretary general Angel Gurria in the report. The big question now is whether the Shanghai and Hong Kong results can be repeated across China as it emerges as a superpower.